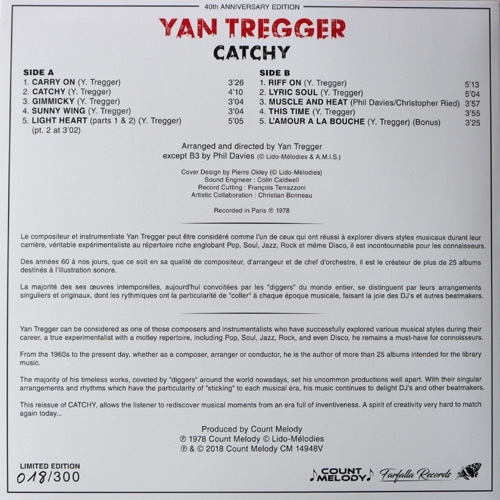 Yan Tregger can be considered as one of those composers and instrumentalists who have successfully explored various musical styles during their career, a true experimentalist with a motley repertoire, including Pop, Soul, Jazz, Rock, and even Disco, he remains a must-have for connoisseurs. From the 1960s to the present day, whether as a composer, arranger or conductor, he is the author of more than 25 albums intended for the library music. The majority of his timeless works, coveted by "diggers" around the world nowadays, set his uncommon productions well apart. With their singular arrangements and rhythms which have the particularity of "sticking" to each musical era, his music continues to delight DJ's and other beatmakers. This reissue contains 1 bonus track from the 1974 movie "L'Amour à la bouche" (aka Mannequin) directed by Gérard Kikoïne.